For the last several months, getting to the range has been challenging so my live fire practice has suffered. We’ve had lots of rain in San Antonio which has rendered range conditions unacceptable. In this practice session I decided to focus on self defense shooting skills. I shot the drill cold with no warm up using my normal carry pistol. I carry a SIG P320 with an X-Carry Grip Module, a 3.9 inch barrel, and the slide modified to use the Trijicon RMR. I use the RMR06 with the 3.25 MOA dot for reasons I will explain below; however, I used the back-up iron sights only for this drill. Seventeen shots to the body, three shots to the head for a possible score of 100. As you can see in the photo (small circle), I dropped one shot in what would have been the -1 equivalent on an IDPA target. Per KR Training scoring, this would equate to a score of 98 out of a possible 100. -- From a holstered position on command draw and engage the target weapon hand only, standing position, with 6 shots in a 3-2-1 sequence without returning to the holster. Shooters will remain in place during this sequence of fire. (time limit: 4-3-2 seconds) Reload. -- From the ready position; engage the target with 6 shots support hand (two-handed grip). (Time limit: 15 seconds) Shooters will remain in place during this sequence of fire. 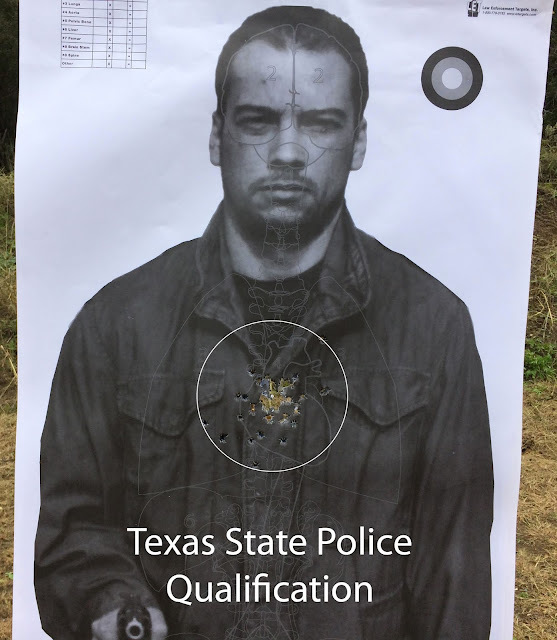 -- From the holstered position, on command draw and engage the target with 6 shots standing (two- handed) move one step left and engage the target with 6 more shots. (Time limit: 20 seconds) Reload and on command re center on target. -- From the holstered position, on command draw and engage the target with 6 shots standing (two- handed) move one step right and engage the target with 5 shots standing or kneeling. (Time limit: 25 seconds). Total number of shots fired is 60. Qualifying score is 240 or above out of a possible of 300 or 80 percent. My score was 300 using the more stringent IDPA-style scoring. I finished the practice session with five head shots from 75 yards. Twenty-five yards and beyond is where the red dot really becomes a significant aid. My first encounter with a red dot on a pistol was in NRA Bullseye competition many years ago as competitors began mounting the Aimpoint G2 and MKIII on bullseye pistols. We had guys that could hold the 1.695 inch “X ring” at 50 yards on a standard NRA bullseye target with one hand. I personally detested the red dot because I simply did not have the skill to hold it steady enough and the bouncing red dot was a distraction. Fast forward to the modern red dot that the Trijicon, Delta Point, and others represent. Although a quality red dot is not cheap and it does take practice to master its use, the red dot will enhance your capabilities as a shooter beyond what "traditional" equipment will allow. 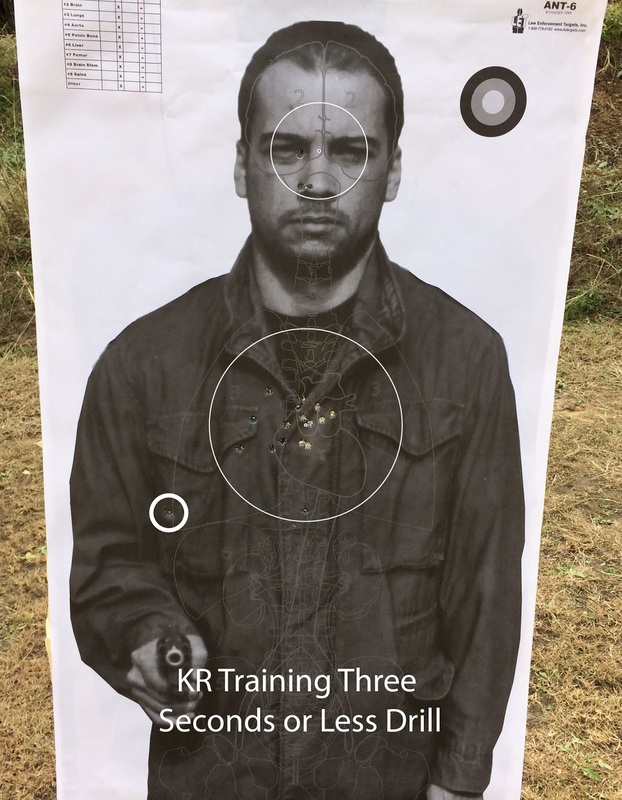 In 2018 I worked on my longer-range pistol skills. At one point I was using a 6.5 MOA dot and discovered that the dot size covered up too much of the target at longer ranges. I switched to the 3.25 MOA dot of the RMR06 which is visible enough for fast-paced, closer range precision shots while also working well for longer range (greater than 50 yard) shots. 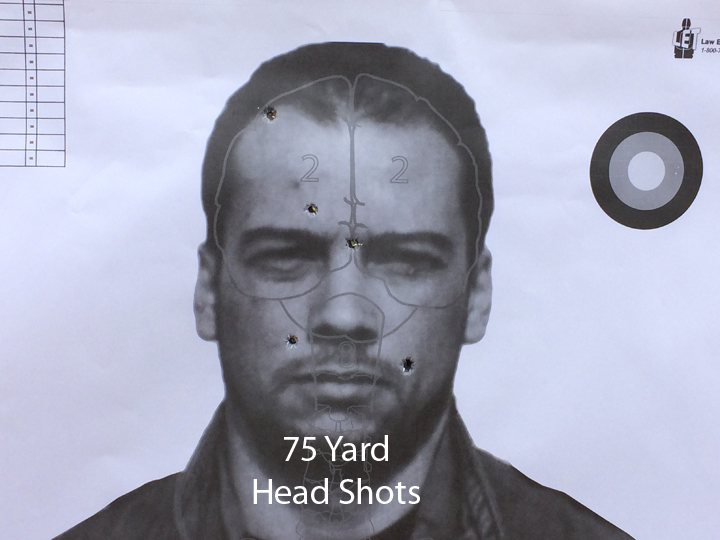 The picture below shows the results of five shots fired from 75 yards at the head of the photorealistic target. This target’s head is 20% larger than the IDPA target so the shot in the upper left would have missed an IDPA target.